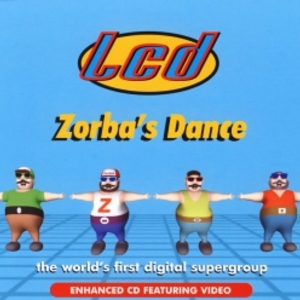 '''LCD''' were a computer generated dance act, active in the late 1990s. Signed to Virgin Records, their one hit single was a euro pop version of the Greek song "Zorbas", entitled "Zorba's Dance". The music video to the song, made in computerised animation, featured a band of overweight men playing the song. The single was a club hit in the UK, charting twice in the Top 40 within 18 months of its original release,and was one of the first of its kind which was enabled to be played on a computer for its music video. The CD to the single pronounced self-exclaimed LCD as "The world's first digital supergroup". The man behind the act was David Kemoun.